Emergency personnel work the scene of an accident where James R. Garton, 54, Osage City, was killed Jan. 18. 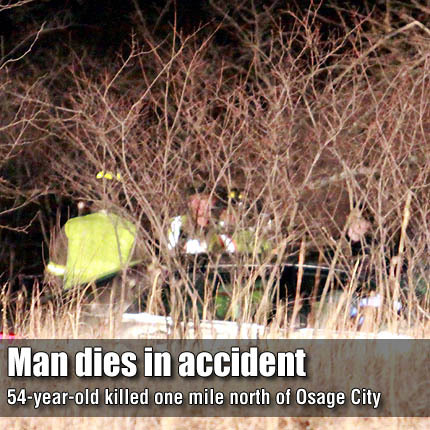 An Osage City man died the evening of Jan. 18 in a one-vehicle accident about a mile north of the city. According to a Kansas Highway Patrol report, James R. Garton, 54, was driving a 2003 Honda Accord westbound on U.S. Highway 56 near mile post 388, or one mile north of Osage City, when the vehicle entered the south ditch and struck a tree. Garton, who was not wearing a seatbelt, died at the scene. He was the only occupant of the vehicle at the time of the accident, which was reported at 5.50 p.m. According to Highway Patrol Trooper Ryan Goubeaux, the accident was still under investigation as of Friday and the cause remained unknown. The Osage County Sheriff’s Office, Osage City Police Department, Osage County Fire District No. 1 and American Medical Response also responded to the call. The vehicle was removed by Santa Fe Trail Collision Center.